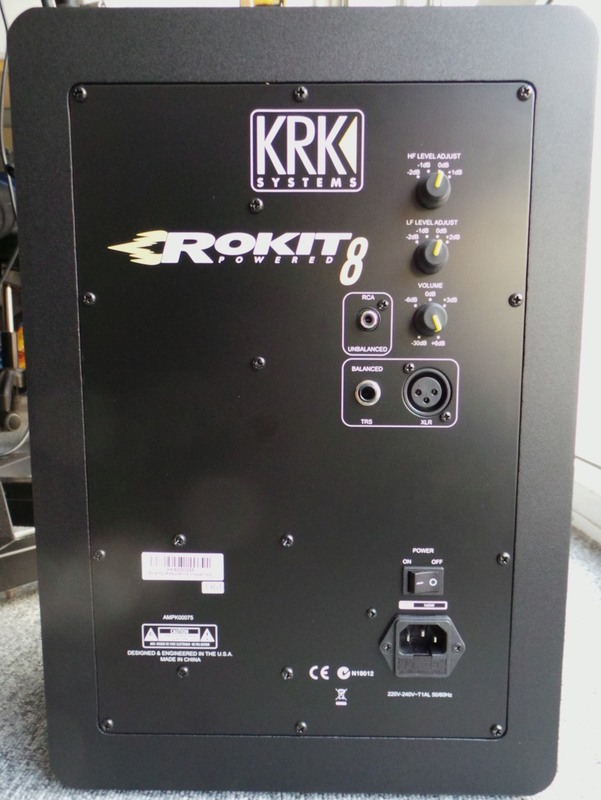 RP8 G3, Active Monitor from KRK in the Rokit Powered G3 series. 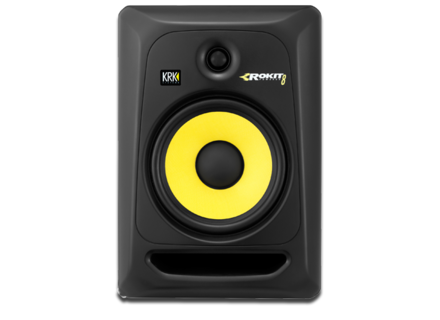 Rokit speakers ─ the entry-level product range of Californian manufacturer KRK ─ have found their way into numerous home studios for many years. 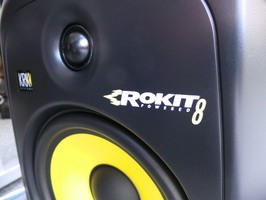 But until the recent release of the third-generation of Rokits, the yellow-coned speakers hadn't had an update in five years and were in need of a face-lift to keep pace with the ever-growing and stronger competition. 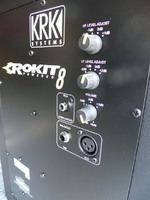 We'll look here at the 8" version, and see what features KRK has added in its latest Rokit launch. 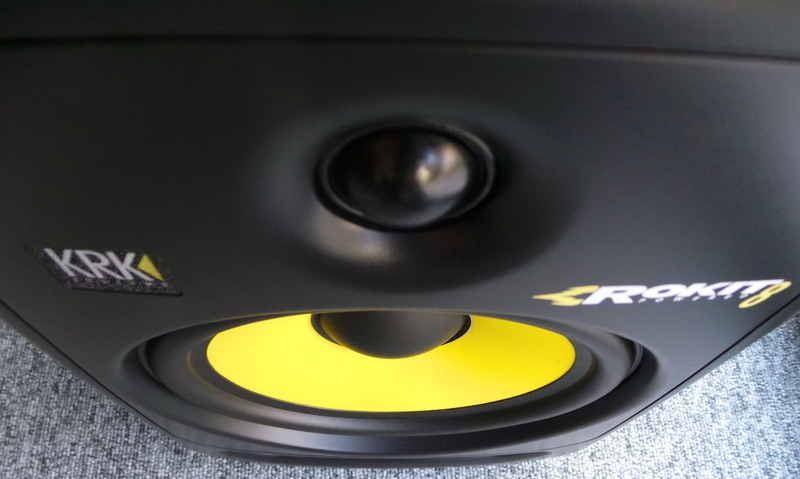 What a bright idea to equip speakers with yellow woofers, immediately identifiable in any studio, living room or store! It's such a good idea that some manufacturers have tried to imitate it with varying amounts of success. 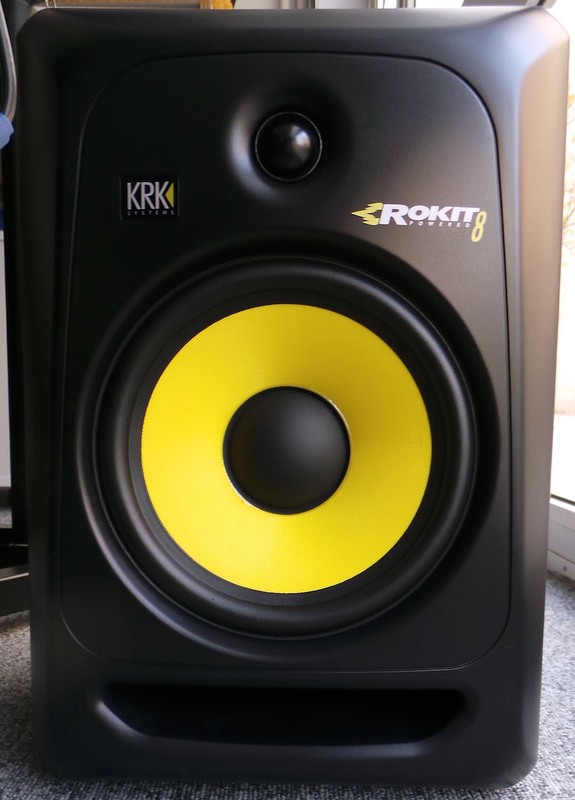 Nevertheless, the yellow woofer has become the KRK symbol, which differentiates it from its competitors visually, acoustic differences notwithstanding. Imagine a musician that comes into a shop and finds himself in front of a wall full of speakers, without the slightest idea of which ones to buy. But he remembers having seen a pair of yellow speakers at a friend's who told him he was happy with them. "What was their name? KRK? OK, I'll take those." The goal of any brand is to be remembered for one reason or another. 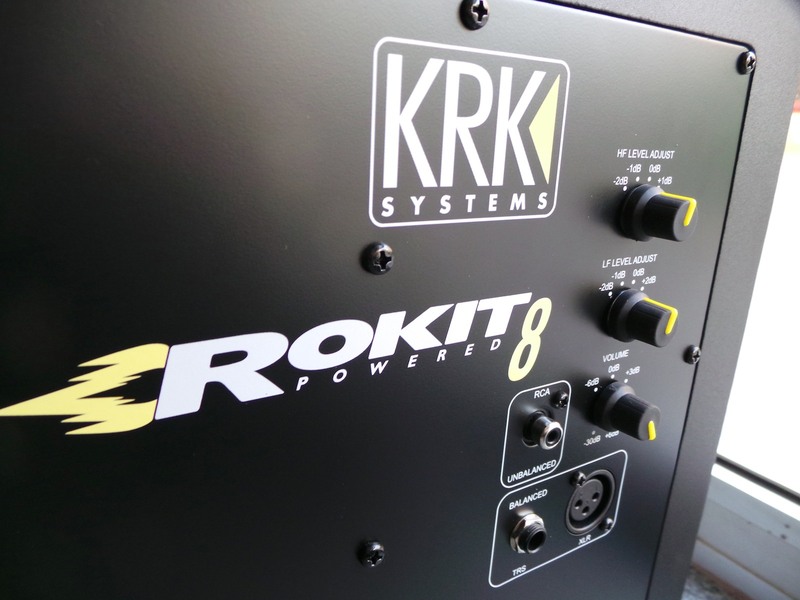 2013 marked the renewal of the Rokit series. 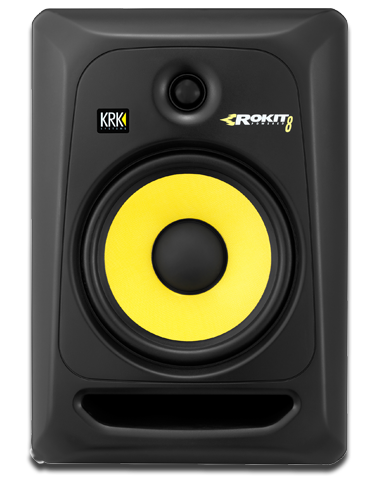 The second generation was released back in 2008, so KRK had to update its speakers to keep up with its ever-improving competitors. Mackie renewed its MR series, Yamaha the HS, and even brands that are not usually spotted in the monitoring speaker section have made their entry into the market, most notably Presonus with its Eris series, whose 8" version impressed us so much that we used it as a benchmark for this review (same size, same price). But before listening to them, let's take a brief look at the new KRK. This third generation recaptures the look of previous ones, except for some details. The screws that used to be visible on the front panel aren't anymore, and the form of the vent (in the front) has changed a bit, but apart from that, the speakers remain the same. The two-way speakers are still equipped with an 8" fiberglass woofer (Aramid Glass Composite) and a 1" tweeter on top. 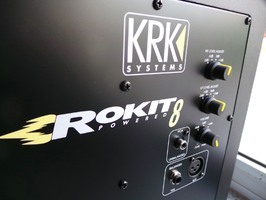 To power everything, KRK uses two built-in class A-B amplifiers (25 and 75 Watts) and the crossover filter is set at 2kHz. 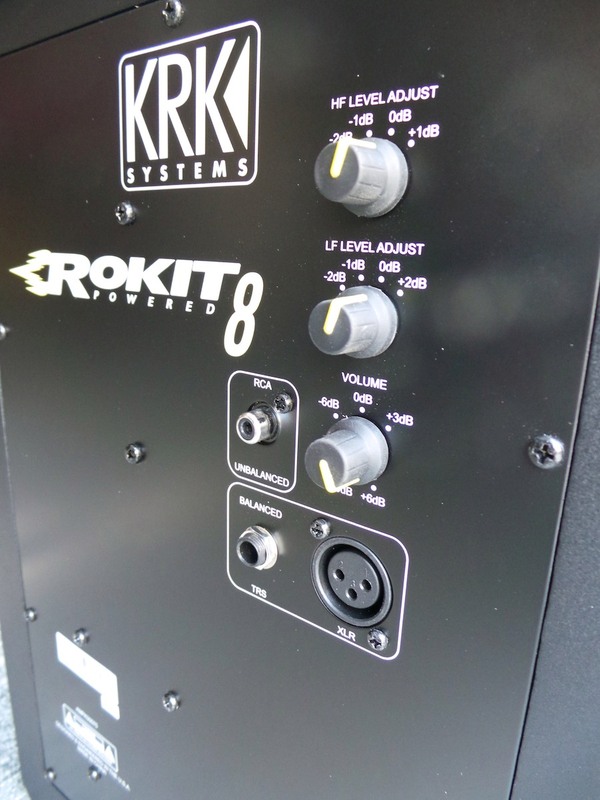 The Rokit 8 G3s, with MDF enclosures and vinyl finish, are a bit larger than the Eris (12.4" x 10.8" x 15.6") and weigh 24.6 lbs. The cherry on the cake is the slim foam pad on the bottom, which is meant to reduce desk or stand vibrations. 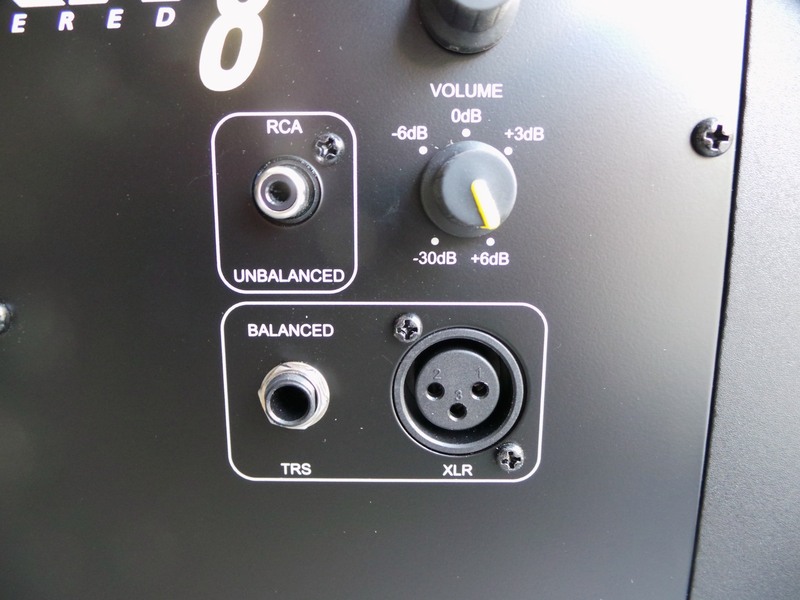 On the back panel are the RCA (unbalanced), TRS jack and XLR (balanced) inputs, plus the power switch (which makes the logo in the front light up). Three knobs allow you to adjust the high frequencies (from -2dB to -1dB), the low frequencies (from -2dB to +2 dB; a new feature that wasn't available on the G2!) and the input gain. However, the manufacturer doesn't specify the frequencies affected by the knobs. 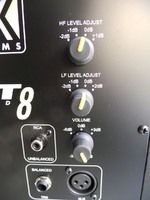 If the HF knob only affects the level of the tweeter, it should act above the 2kHz crossover. 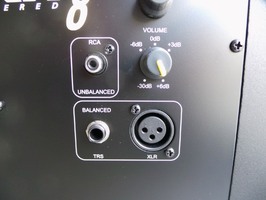 Regarding the LF knob, the manufacturer recommends you to set it to +2dB in free field, -1dB when the speakers sit against a wall and -2dB when placed in a corner. The speakers switch to stand-by mode when no signal is detected for a 30 minutes, a very good feature, even if you have to wait a couple of seconds before they are operational again (by sending them a signal). Now, it's time to listen to them. We compared the Rokit 8 G3 with the Presonus Eris E8 monitors, which, as mentioned, impressed us quite a bit when we reviewed them. 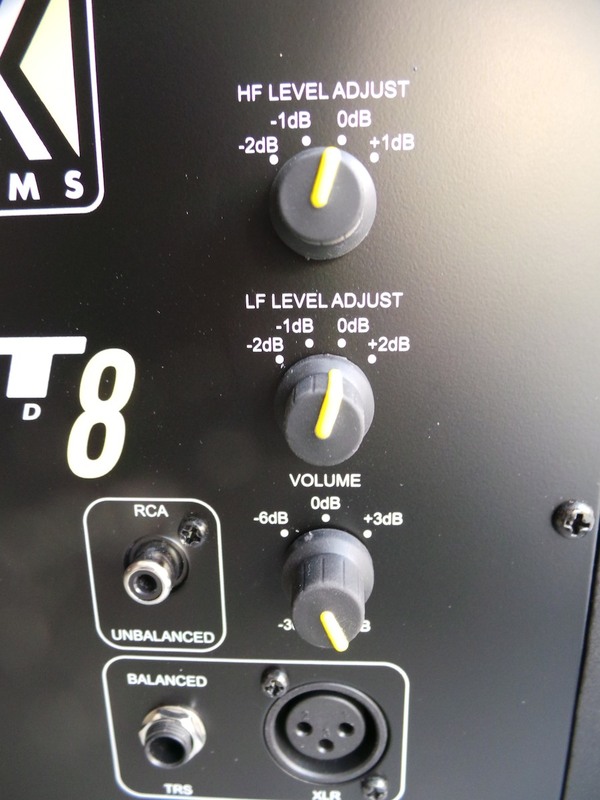 We connected both speakers to our Metric Halo ULN-8 interface, which allowed us to toggle between them instantly while listening to mixes we knew pretty well (in lossless quality and sometimes also at 96 kHz/24 bit). Right from the start, we noticed that the two sets of speakers didn't reproduce high-mids between 1kHz and 6kHz the same way. While the linearity of the Presonus Eris E8 across the full frequency range was quite convincing, the KRK exhibited a small dip between 1kHz and 6kHz, which resulted in less accuracy in the attacks of certain instruments and also made the vocals of Gardot less present. The dynamics seemed better on the Eris as well, whereas the stereo image was very similar. We also noticed another dip between 200Hz and 300Hz, which made certain instruments lack fullness. The Eris's were more accurate on this mix, reproducing the vocals more faithfully. The same thing happened with Hetfield's vocals, which got swallowed in the mix on the KRKs. The Rokits rendered a more boxy mix, and the guitar layers became hollower, making everything less understandable. This dip in the high-mids/highs is regrettable, considering that these frequencies are particularly important when mixing a song. You will have to be careful not to boost these frequencies too much or you may risk ending up with fatiguing mixes. Another point for the Eris. We finished up our testing with Strauss. Not surprisingly, the result was pretty much the same as with the previous examples, although less obvious. The same feeling of distance was there, with less present brasses and the impression that some instruments disappeared on the last sustained note. In our opinion, the Eris won the listening test hands down, with a better linearity, greater accuracy and better dynamics. And, considering that the KRK lack a control to adjust the mids, it's not possible to put things right. The addition of low frequency control is an improvement over the Rokit G2, but it's somewhat poor in comparison to the Eris monitors, which feature four filters. This third generation of Rokits has seen the introduction of a couple of new features ─ like a filter for the low frequencies ─ but they are meager and not enough to keep up with competing products. 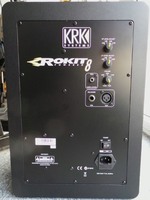 The linearity of the KRK is relative and they lack a mids control. In spite of that, the speakers do offer some advantages, like the automatic stand-by mode, but in our opinion, they're not enough to place them among the top products on the market.